Designed for under cabinet mounting. Optimized for T8 or T5 lamp performance. Snap together body and ballast cover. No fasteners required. Ribbed white acrylic diffuser. Fixture housing, lampholder brackets, end sections and channel cover constructed of code-gauge, die-formed steel. ETL listed. Suitable for damp locations. Damp location emergency pack must be specified separately. Ballasts are solid-state electronic. 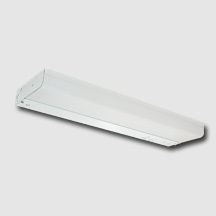 Ballasts and lamp holders are replaceable without removing from ceiling. Discrete voltage must be specified for emergency pack options when wired with flex. Comes standard with ballast disconnects for safe maintenance.